Opis: Spanning over 25,000 light-years, comparable to the distance from the Sun to the center of our own Milky Way galaxy, a cosmic jet seen in X-rays blasts from the center of Centaurus A. 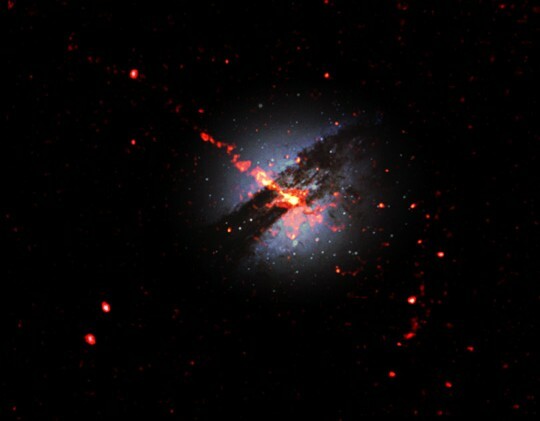 Only 10 million light-years away, Centaurus A is a giant elliptical galaxy - the closest active galaxy to Earth. This composite image illustrates the jumble of gas, dust, and stars visible in an optical picture of Cen A superposed on a new image recorded by the orbiting Chandra X-ray Observatory. The X-ray data is shown in red. Present theories hold that the X-ray bright jet is caused by electrons driven to extremely high energies over enormous distances. 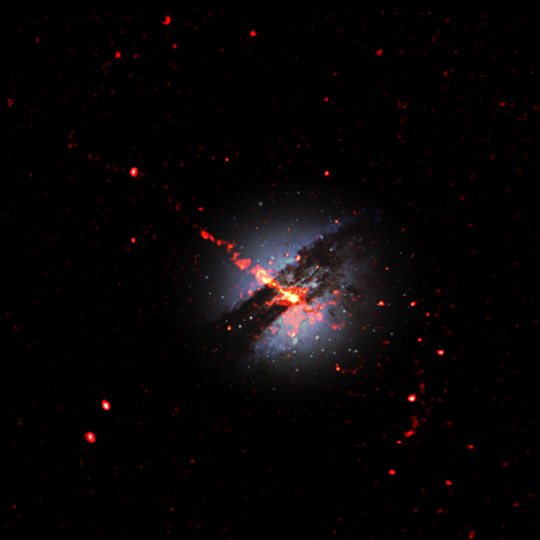 The jet's power source is likely to be a black hole with about 10 million times the mass of the Sun coincident with the X-ray bright spot at the galaxy's center. Amazingly, while some material in the vicinity of the black hole falls in, some material is blasted outward in energetic jets. Details of this cosmic power generator can be explored with the Chandra X-ray data.